On the opening night AFFR will screen Cholet, by the Brazilian documentary filmmaker Isaac Niemand. This film portrays Bolivian architect Freddy Mamani and his work. 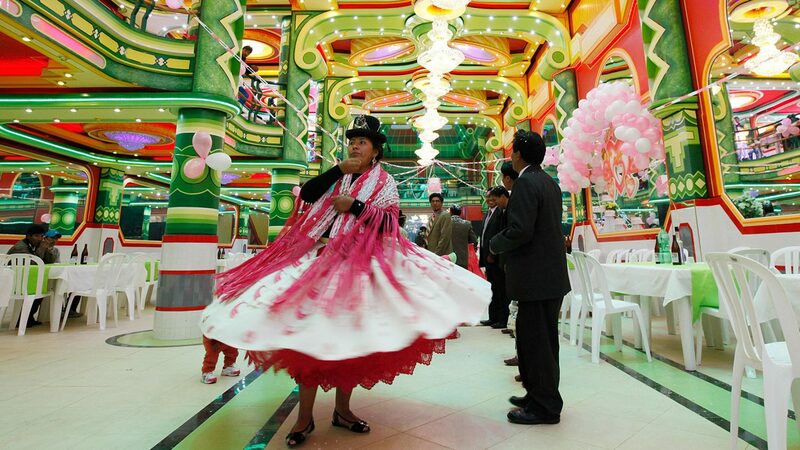 Freddy Mamani is very successful in his home town El Alto. What was once considered a colourless, monotonous city is rapidly changing into one with extravagant streetscapes. Through his exuberant colour painting combined with ceiling decorations, ornaments and chandeliers, Mamani’s style is best described as psychedelic baroque. The film raises questions about the work of Mamani. Is it real architecture? Or is it mere decoration, albeit excellently executed? To get some answers, and his perspective on Mamani’s work, AFFR reached out to director Isaac Niemand. How did you learn about the work of Freddy Mamani? I first saw some photographs on the net. Months later I was part of the first edition of LAD, the Latin American Design Fest in Lima, where Freddy presented his work. He got a standing ovation. This was when I thought it would be great to know more about him, and share it. Why did you want to make a documentary about Freddy Mamani’s work? He was all over the news — Aljazeera, BBC, CNN, all sorts of sites and magazines, but all of them were just focusing on the kitsch and bizarre perspective. It was superfluous. None of them were trying to explain what was behind the work. And well, filming is the perfect excuse to get into places and meet people, and eventually a way to sublimate life. I spent a total of one and a half months filming in El Alto. What did you experience when you first stepped into a Freddy Mamani building? I remember I had a synesthetic experience. I was wrapped in a crazy combination of colours and shapes that went beyond architecture. A mix of performance and art installation, a full set of Pantone all over the walls. It quickly triggered flashbacks from my teenager experience with LSD. It’s quite exceptional, considering El Alto is basically a colourless city. In the film Mamani discusses the imitations of his work. Could you tell the difference between an imitation and the real thing? Seeing the imitations is like seeing a Chinese counterfeit gadget. They look alike from far, but once you are close you see the difference. Basically, Freddy takes more care with the details. Also, he takes all the historic and mythological Aymaran background more seriously. It seems like the imitations are not even aware of the existence of Tiwanaku. In the film, one of the interviewees says that Mamani’s work is more decorative than architectural. Do you agree? I don’t see architecture and decoration as two separate things. But it’s true that Mamani specially emphasizes covering the structure, and not so much the structure itself. But there’s one important aspect: the Cholets are extremely functional — definitely more functional and socially oriented than most contemporary architecture. Therefore Cholet cannot be just decorative and has to be architecture too. Although, to orthodox academic eyes, Cholet looks more like a birthday cake. In the film, Juan Carlos Calderon notes that European audiences often perceive Latin American architecture as exotic. Aren’t you afraid this is going to happen with your film? Undoubtedly, Mamani’s work is going to be perceived as exotic. And this has to do with Europe’s ethnocentric conception of the world. You need to understand the folkloric side and social structure of Amerindians. Making a Western interpretation is just irrelevant. Was that the reason you emphasized the socio-political context of Mamani’s work? Without that social-political context, there simply wouldn’t be a Freddy Mamani at all. There wouldn’t be wealthy Aymarans to pay for his work, and not even any need to have such big buildings. Freddy is a product of a complex historical context. Understanding this helps to better understand and appreciate where he stands now. Are there any other misconceptions about his work? There are many views, just like in other art forms, which doesn’t mean that they are misconceptions, I would rather say there’s a lack of information to provide a better perspective. I hope that this film may help to dispel any misconceptions. How does the film relate to the theme ‘City for Sale’? How do you see it? I believe El Alto is for sale, no doubt. It is growing faster than any other city in the world. It will not stop any time soon, since La Paz cannot grow further. Most importantly, I think that El Altiplano, the plateau on which the city is located, is not meant for mankind. The whole thing looks like an accident that went too far. And yet, they are making it happen. Tickets: Buy your tickets (€ 12,50) for Cholet, the work of Freddy Mamani + AFFR-Party on Wednesday 4 October online via the website of Theater Rotterdam. Volgend item Welcome to AFFR 2017!